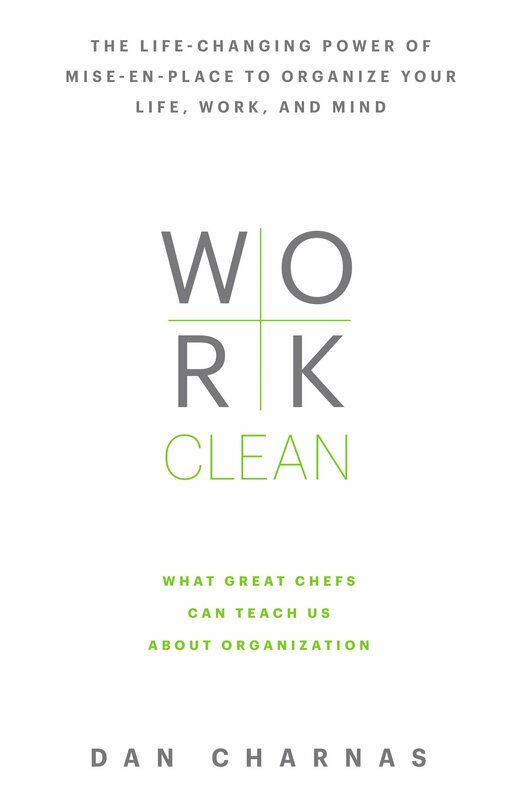 Having worked with leading chefs in the United States, the author Dan Charnas talks about how to plan, organise and clean up so that you get the best out of your activities. Throughout the book he illustrates stories and scenes from the America’s top restaurants that exhibit thorough planning, organisation, cleanliness, minimalism and maximum utilisation. Charnas extends the knowledge gained from cooking into his personal and professional lives. In this book, he teaches us how to do so. At the start he describes a fictional character named Jeremy. Jeremy doesn’t plan his day. His desk is an unkempt mess. He leaves things unattended and doesn’t finish up tasks or tie loose ends when interrupted with another task. Most of his time is spent looking for things, being preoccupied and not paying attention and losing track of possessions, appointments and deadlines. He misses deadlines on presentations and his son’s football practice alike. He is always on the edge and angers his boss, colleagues and his family with his inefficiency. Charnas then likens the pressures we face in our daily lives to situations similar to Jeremy. All of us could do with more planning, organisation and cleaning up. Next, Charnas identifies the following ingredients to set up a life of mise-en-place and balance. Let’s go through them one by one. Planning: Charnas describes a simple system where we use two tools: checklists and a calendar. For all our activities we need to prepare checklists to identify what to do. From the checklists, each item must move to a slot on the calendar. This clarifies the what and when. Without these, you will be confused about how to use your time and do everything inefficiently as whim takes over. Arranging spaces: Arranging spaces can make you super efficient and allow you to finish your work at twice or thrice the speed of an adhoc method. Charnas gives examples of how chefs arrange their counters and how he learnt to arrange his dish washer and things around it. The first rule of arranging spaces efficiently is that your movement to and away from your workplace should be minimal once work is started. E.g. thumb drives should be right beside your computer. Pens should be on the desk before you start work. Next, he suggests moving less inside your workplace. Things used most frequently must be within easy reach compared to things that are used rarely. If you are doing something sequential, e.g. then the required material and tools must be arranged in the same sequence. E.g. if you are packing things, then the largest items should be nearer to you. Once those are packed, you start getting to the smaller objects. The sequence of unpacked objects should be kept in the same order in which you want the packing to be done. Finally, he suggests minimising spaces. The size of the workspace should only be as large as the space required to hold you along with all the materials and tools you need for your work. Everything should be within arm’s reach. Larger spaces lead to more movement inside the room to get things or more stretching to reach things. Cleaning as you go: The top chefs in the world clean up almost immediately. In fact they have staff who can wipe counters, sweep the floor and wash the dishes all day. A messy workplace causes a feeling of claustrophobia and hopelessness. It causes stress. Cleanliness means the exact opposite. It gives a feeling of ampleness. It signals a fresh start. It is necessary for you to clean your spaces at regular intervals. There are two time slots to do it. One is to schedule a regular cleanup interval every time you finish one task and are ready to start the next. The other good slot is when waiting for a handed off task to finish, e.g. while you are waiting for someone to finish up or for a device to complete processing. Making first moves: Charnas identifies two types of tasks that are needed to achieve anything. One type is an immersive task which needs your undivided presence. E.g. writing an article, frying a dish on the stove, scrubbing the soiled collar of your shirt, etc. You can do only 10 – 20 of them per day before you run out of time. But there are other tasks that do not need your constant presence. But they do need you to trigger them. Even though it takes you only a couple of seconds to start them, some of them take a long time to complete. Several other tasks may depend on the outcome of this task. So it is important to kickstart them. These are called processing tasks. Examples are: boiling rice for your biryani recipe, downloading an operating system, activating your fully automated washing machine and submitting a speed post at the post office. Finishing actions: Charnas highlights the importance of finishing up the previous task before you start a new one. Ideally, you should complete a task during the time allotted for it. This gets the task out of the way. But sometimes, you estimate incorrectly or find that something required for the task is suddenly unavailable. For unfinished tasks, you should bail out early when you know that you will be unable to complete them. Our instinct tells us to rush for the finish when just 10 minutes remain. But that leads to substandard and unsustainable work. Instead you should embrace the failure of the deadline and exit early. Next, you should spend the remaining time to tie up loose ends and wrap up the task in a way that makes it easy to resume it when it is scheduled next. Whether you finish a task or not, you must clean up your workspace to its original position before beginning the next task. Please read about cleaning up as you in one of the paragraphs above. Charnas also talks about 4 feelings that distract you and hinder you from finishing the task at hand. Fatigue: You are tired either mentally or physically. Your energy is low and it is blocking your finish. Fear / anger / despair: Fearfulness and anxiety about the results and anger or despair about your situation at work will often distract you from work. Ambition to move on to higher things: This often affects big picture people. In their mind, they are moving on to bigger and better things. This makes them feel that the current task is trivial and they often feel bored. This can happen if you are writing just the 10th page of the manuscript of your book and you are already thinking about which publisher to contact for publishing and marketing. Scatteredness: A cluttered workspace or a scattered schedule can lead to a distracted mind and hinder the progress of your work. Overconfidence: Complacence can lead to lack of attention and care. As a result, you work suffers. Slowing down to speed up: If you find that too much speed is causing mistakes as a result of you either being wrongfooted or having to play catch-up, then you should slow down deliberately and start paying attention to what you are doing. Your speed is actually getting in the way of good work and you are having to trash and redo things, thus slowing your results down. Open your eyes and ears: There is a fine balance between paying plenty of attention and letting in noise. If you pay too much attention, you are letting in unnecessary input. If you tune out, then you miss key communication. Charnas suggests that you identify exactly what you need to pay attention to. For most of the day you should be focused on your work, but you should keep your eyes and ears open for specific sights and sounds so that you don’t miss really important points. This needs a lot of practice. Call and callback: When you instruct someone, your instruction should be as short as possible. But it should have enough information to convey what you want done. When you listen to instructions, always acknowledge that you have understood and then repeat the whole instruction again. Inspect and correct: When you depend on others working for you, it is necessary, especially during the early days, to keep an eye on what’s being done. You need to constantly inspect delegates’s work and close the loop with precise feedback as soon as possible. Total utilisation: You should try to use much of the resources available to you as possible. E.g. papers with one side printed on can be later used to take down notes on the blank side. After unpacking products, the empty cartons need not be thrown away, but rather be used for some packaging of your own. A daily meeze is a daily ritual at the end of your workday, when you plan your next set of tasks. There are three parts to a daily meeze. In the first phase, you empty all the accumulated things in your workplace and identify what to do with them. Unwanted things should be discarded. In the second phase, you schedule the remaining things on a calendar either as a once-off event or as a routine. In the final phase, you do a quick tidying up of the workplace and finish up the day at your workplace. The Work Clean book inspires you to add more order to your chaotic day. Reading this book will teach you how to plan, organise, schedule and clean up every field in your life. You will never have to look at chaos and clutter again. A good guideline for today’s distracted generation to work more efficiently. Yes, that’s true. It pays to keep things organised and clean. It cuts down the prep time so much. Previous Previous post: How to change a habit? Next Next post: How to keep your Brain Young?